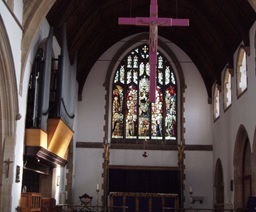 St Saviour’s Church, is situated in Raynes Park SW20 9DL. 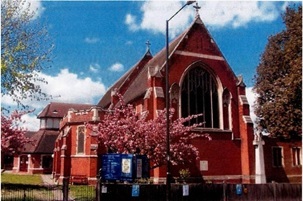 It was consecrated 14th July 1906 by the Bishop of Southwark, and renovated in 1989 when the rear ground to the west of the church was sold to build Warden Assisted Housing. Funding also allowed the rear of the church to be refitted with a Narthex, Hall and Upper Room with lift, and a North range extension providing kitchen, toilets, storage and a corridor to the vestries. The church is light, spacious, well heated, fully carpeted with 175 individual chairs that can be placed in any configuration desired. The altar is the focal point for the whole congregation with a wonderful stained glass window on the East wall, and smaller stained glass windows to South and North aisles. To the left of the nave we have a small Remembrance Chapel where candles can be lit and the Remembrance Book is kept. To the right of the nave we have the Lady Chapel where smaller more intimate services take place. At the back of the church we have a beautiful statue of Our Lady which is much appreciated for personal prayers and to light candles, and in the centre of the back of the church is a new font for baptisms. We have a superb William Hill organ built in 1907 completely renovated in 1996, and we now have regular organ recitals, concerts, and use by a local choral society West Barnes Singers for choral performances. A comprehensive sound system was installed in 2016, with lapel and hand-held microphones, hearing loop and CD player. At the back of the North aisle is a children’s area to enable young children to visit during the service. There is also a creche area for babies and toddlers so that parents can still participate in the service. We have disabled toilets and ramps, and a lift for access to the Upper Room, which with the main hall is almost fully hired out for community events and private functions. At the East end of the grounds we have a listed WW1 War Memorial which we are in the process of renovating to restore the 97 carved names, and a listed Holm Oak Tree. To the South of the church we have a large grassed area and car park. 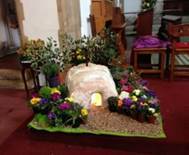 We have a dedicated Flower Committee who weekly arrange fresh flowers for the Church and decorate the Church for special occasions. We are particularly grateful to a small group of loyal church members who keep our grounds beautiful and maintain the fabric of the Church.